Scalp Micropigmentation is a modern hair loss treatment. We help men and women that are experiencing a level of hair loss that they want to change. Many of our clients have used treatments and methods that have left them unsatisfied. Hair loss is deeply affecting many men and women, and we are dedicated to improving the lives of each and every one of our clients. We do this by delivering the ultimate Scalp Micropigmentation experience. Scalp Micropigmentation aka “SMP” (aka Hair Tattoo/Scalp Tattoo) is currently the Ultimate, non-surgical solution for hair loss. We provide an instant, permanent, and life-changing treatment where thousands of organic pigments are precisely applied to the scalp to replicate the natural appearance of real hair follicles. Whether you want to fill in a scar, a thinning area of your hair or have Alopecia, SMP will enhance your look tremendously. You will instantly look 10 years younger. We are regarded as one of the leading Micropigmentation companies in the world with many years of experience, and that has helped us in developing our own custom equipment, process, and procedure. Chris Herrera is one of the most respected SMP artists in the world. Clients and upcoming artists fly to Maryland from all over the world to have their procedure done by him or to be trained by him. I am a scalp micropigmentation specialist, offering a professional and harmless solution to the restoration of your hair, as well as effective treatments, such as the Alopecia areata treatment. Fully licensed, with fifteen years in the business working with hair and counting, and being certified, I am the hair treatment professional you can trust. As an added bonus to the superior technology and vast industry knowledge I possess, I also offer an inexpensive treatment that will restore not just your hair, but your self-confidence, as well. 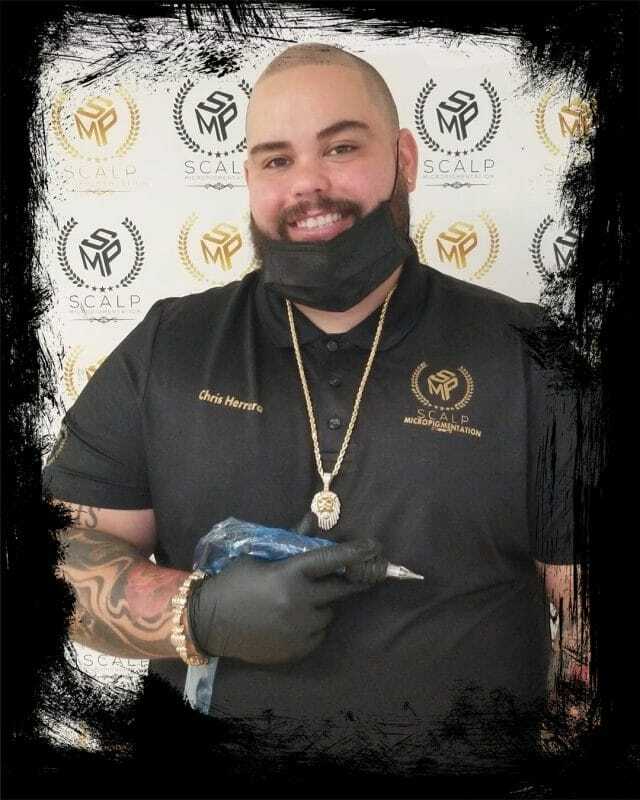 You can easily find me and take advantage of the scalp micropigmentation services I offer, as my shop is conveniently located and available twelve hours every day. Once I get to examine your hair, we will begin with the sessions, immediately. Using the latest hair restoration technology and equipment on the market, as well as some of the top-brand hair treatment products available, you are bound to receive the hair care and restoration services you desire. With my knowledge in the sector, you can expect nothing but quick and lasting results from me. We provide free quotations for all clients considering the scalp micropigmentation procedure. We prefer to see all our clients face to face but we can also provide quotations via email or messenger.